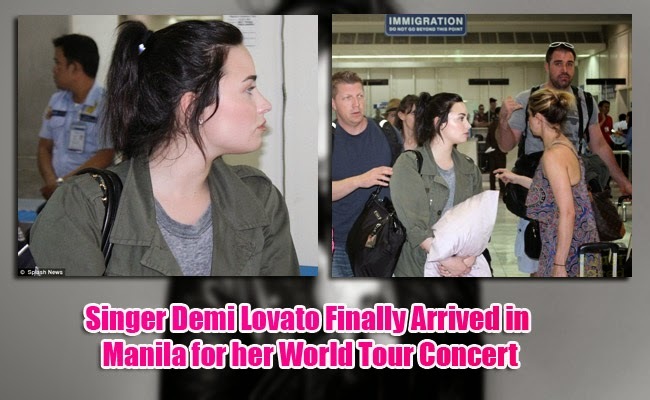 American singer- actress-songwriter Demi Lovato had arrived in Manila on April 30, 2015 at NAIA Terminal 3 for her one night concert on April 30 at Mall of Asia Arena as part of Demi World Tour. Lovato came to the country for the first time in 2013 for her Unbroken Tour and now she is back and excited to have her second concert in front of her fans. In her live interview with Boy Abunda and Kris Aquino, Lovato shared the warm welcome she received from her Filipino fans. She shared that everyone made her feel welcomed. Lovato also shared that when she sung "Warrior" in her concert, she had dedicated the performance to Olympian Bruce Jenner for his brave admission about his gender transition. She expressed that he had been brave for doing such a difficult feat and he made her proud though she does not know him well. Lovato invited her fans to see her performance as she is excited to perform for them. Her fans had welcomed her in the airport and she had felt their warm welcome. Lovato’s real name is Demetria and she had first rose to fame as singer and actress when she played as Mitchie Torres in ‘Camp Rock’, Disney’s musical movie. She had released 4 albums ("Don't Forget," "Unbroken," "Here We Go Again," and "Demi") and even acted in other movies. Her latest hits include "Made in the USA," "Heart Attack," and "Neon Lights."